Commentary on design, marketing, advertising, product development, UX, social media and everything in between. Over my career I've worked on a lot of things, mostly around communications, marketing and product development. The main reason I've stuck to these circles is that I am a consumer of it all and it's part of my personal life as well. For example, when I was designing DVR user interfaces and finding cooler ways to find digital entertainment, it didn't feel like work because in a way I was also doing it for myself and not just my target customers. I feel the same way about social media. Be it Facebook, Twitter, FourSquare, or YouTube, it's not always about work, especially if you do it as part of your job or it is your entire job. You need to look at how different segments use it. I think there are good guidelines out there from "pros" explaining to other "pros" how to use social media for business. But I think one needs to be careful not to get caught in the trap of living in the monkey house. Tim Gunn explains the monkey house best. (I have a video of it, but it violates like a dozen copyrights so...we'll see how long it stays up). My point is: Don't get too caught up with the pro blinders on and look outside your social (network) circles to keep things in perspective. Most "pros" have only been doing it for a couple of years too so they can't be THAT much more of an expert than the average person right? Even the founders of Twitter had no idea people would be using it in so many different ways for so many different reasons. There's definitely more than the official business ways to use it and that's why it's so successful. Once you box something in with too many rules, the cool people scatter and move on to the next big, cooler thing--It's the circle of life! That's Chad Rogers from Bravo's 'Million Dollar Listing' calling me out for questioning his reality. That's an up-and-coming jazz singer I saw on NBC Nightly News. She was amazing so I found her on Twitter to ask her if she was going to tour in the US. Nothing on her Website, but ask her directly and get the answer! 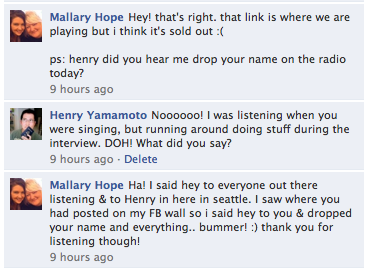 And this is MCA recording artist Mallary Hope who I talk to a lot on Facebook and Twitter. I love country music and it's just fun to actually talk to the artist like this. I mean, what other medium lets you do this? I got to meet her at the Evergreen State Fair this past summer and she and her manager actually knew who I was when I said my name. Made me feel special...and made me a bigger fan. Sure, it's marketing on her part, but goes beyond that when you start having a conversation about Bedazzling a Snuggie. Product manager with keen sense for creating user experiences that differentiate beyond the bulleted list of features any competitor can match. Productized and managed Emmy Award-winning user interface from a concept to a deployed product. So we're not talking about just coming up with good ideas, but being able to assess, plan, manage and deliver a product to a customer.